Comments for Customized For A Raked Frame? Yes the plans can be adjusted for a raked frame. You will need to make adjustments in order to make it work. The length of the tubes will change but you can still keep the top plates at the same distance for the springs. The trail will only get longer as you increase the rake angle. See the photo showing the new rake angle with a 45 degree rake instead of the stock 30 degree rake. I hope the visual helps show the changes you will need to make. Also keep in mind that now that the angles changed, you may need to adjust the length of the solid rods at the bottom where the pins are. 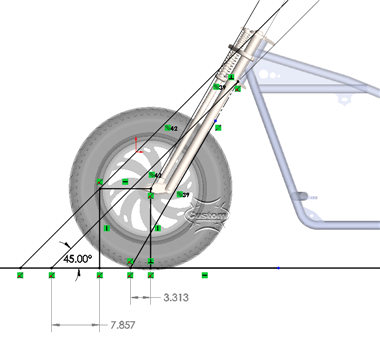 Since it is a shallower angle, please make sure that the axle plate will not jam up against the machined solid welded rods (Item 13 and 14 on the drawing). Design wisely, you also have the option to make the axle plate a little longer. Your trail is 7.8" with a 45 degree rake. The axle plate now has a lot of freedom to grow to add some aesthetic style. Just make sure you stay above 3" in order to maintain control on steering and reduce possibility of flop. Let us know with any other questions or concerns.